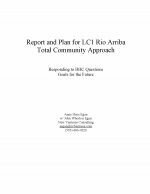 What follows is a plan with capacity building strategies for Rio Arriba Providers, LC1. It also addresses questions outlined by the New Mexico Behavioral Health Collaborative (BHC) and Value Options (VO) in their proposal for the Total Community Approach (TCA) planning process. It raises some additional questions about structure very important to the future of the behavioral health network. Providers, community members and consumers were all involved in the planning process, through interviews, surveys, focus groups and group planning sessions. BHC and VO representatives were also involved. This plan represents the shared priorities and strategies of this diverse constituency group. Where opinions differed based on the group, these are identified and analyzed by the group type. All interview information from individuals and agencies is confidential, reported in the aggregate. Service and funding data was provided by the majority of the Rio Arriba based providers. And financial and service delivery data was provided by Value Options, and data analysis was conducted using this data; key issues and trends were identified. 2. A set of goals to intelligently direct the implementation of the recommendations. The report analyzes funding for services, the mix of services in the continuum of care, recommendations for shifts in services and funding, outcomes and other quality issues. Recommendations include some shifting of the service mix and funding, strengthening LC1 and the agencies within, working with leaders to build greater collaboration, building greater skills with outcomes, service and financial analysis, and working with LC1 to locate some new sources of ancillary funding. New Ventures thanks LC1 leadership, providers, consumers and community members for being involved in the planning process, including many meetings. There were approximately 150 different people involved representing many different stakeholder groups. Additional stakeholder groups need to be involved as the plan moves forward. We would like to thank Value Options for providing data, answering questions and being involved in the planning at key points. We would like to thank the state’s Behavioral Health Collaborative for providing staffing to the LC1, and helping to facilitate the process. Notify us if you have problems using our site.